The 4QD battery condition meters are small LED meter boards. 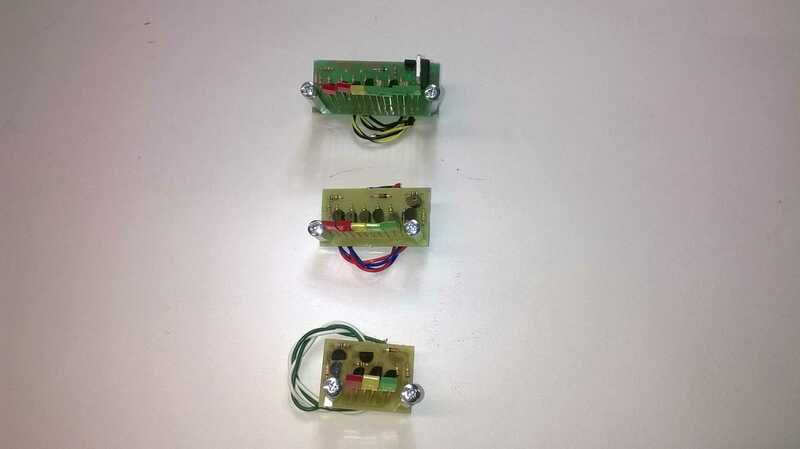 Available as a 3 LED version for 12V, a 5 LED version for 24V & 36V, and a 7 LED version for 48V. The circuit uses LEDs (Light Emitting Diodes) to give a ‘line of light’ type display which extinguishes from the top as the battery is discharged. In most applications it is connected to the battery via an ignition switch so that it extinguishes when the machine is turned off. By using LEDs the boards can tell you more about the battery than a simple moving coil meter will: this is because the LEDs do not suddenly switch on and off, but each LED fades over a range of voltage. The voltages are also more accurate than cheap moving coil meters. The circuitry is very versatile and can be adapted for anywhere a ‘line of light’ type voltmeter is required. The different models can be customised for different voltages subject to a minimum order quantity. Note that the yellow LED goes out at about 10.5v (21v or 2 x 10.5v for the 24v versions, 31.5 for 36v and so in). This is about the lowest voltage you should discharge a lead acid battery to: over-discharging a battery can permanently damage it. The ‘span’ on the 5 LED meter is about 8 volts – which is OK for 24v operation and for 36v. Span on the 7 LED board is about 10v. The boards mount behind a panel, with a rectangular slot for the LEDs and two fixing holes at the end of the slot. Full details are in the instruction manual.